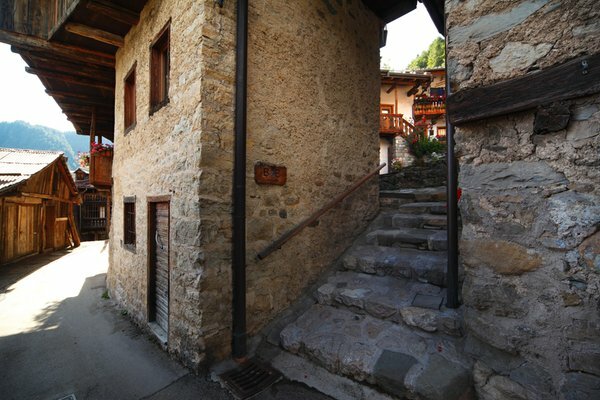 The village of Fornesighe (1000 m), typical for its architecture, offers tranquility and hospitality in line with its traditional customs. 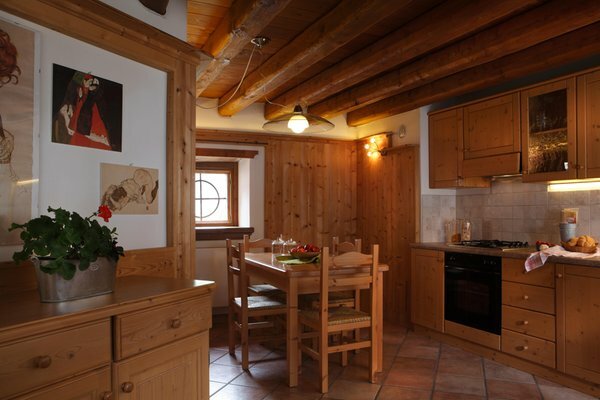 It is positioned in a sunny and strategic location for winter skiing or summer hiking in all the Dolomites. 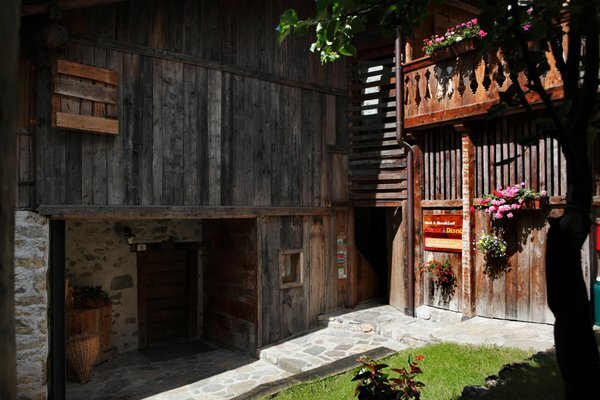 The Locanda Dormì e Disnà is situated in the historical centre of the village, a traditional building in wood and stone dating back to the 18th century and offers rooms and apartments. Its restoration fully respects the original structure, which offers peace and relaxation in a friendly and welcoming atmosphere. 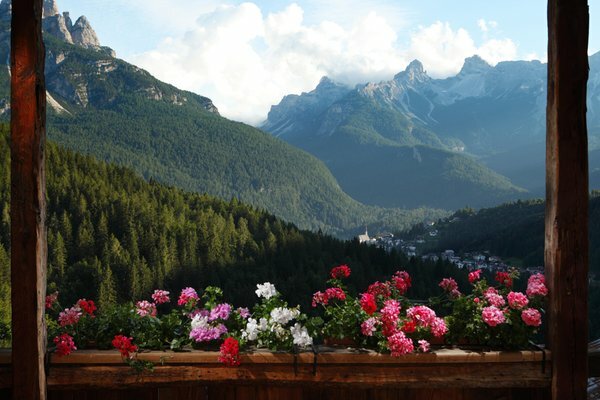 The breakfast room overlooks a magnificent panorama of the Dolomites, which you can also admire on the terrace. 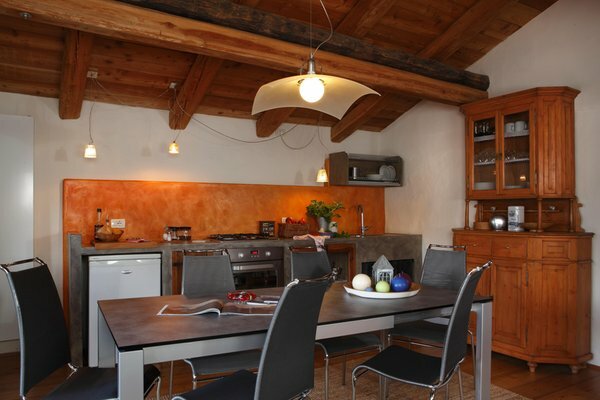 In the simply furnished but warm and cosy interiors old and modern elements are combined with originality. The house also features a small library and is equipped with an internet point / wireless connection. The bedrooms reflect past times with their simple but functional furnishings and are all equipped with private bathrooms and satellite TV. Each one is different from the other, and where possible the old wall decorations and doors have been maintained. 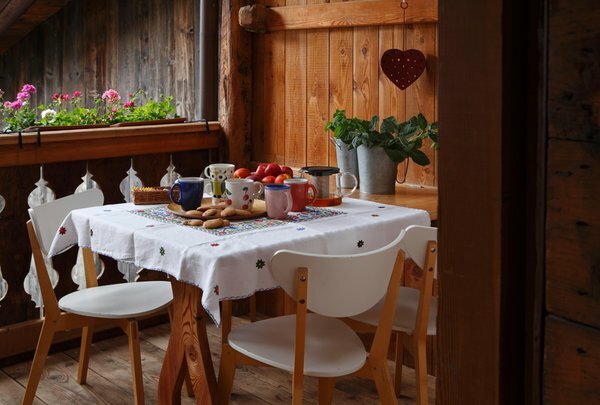 The attic room overlooks the village rooftops and has a lovely view of the village church, while the other rooms offer a beautiful panorama towards the valley and the Dolomites. 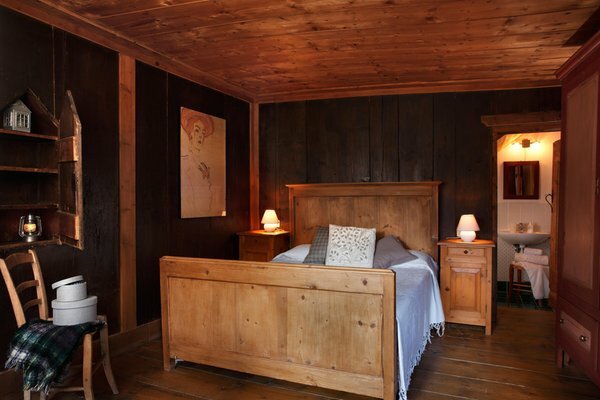 The apartments are all in typical renovated houses true to the original structure, combining the comfort of modern furniture to the warmth and originality of past settings. 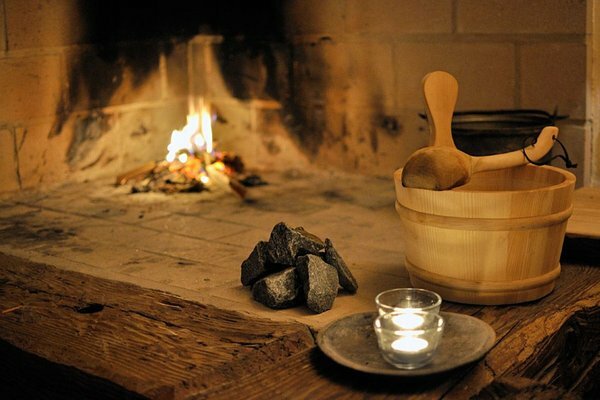 Each unique to itself, fully furnished and located near the Locanda Dormì&Disnà, you can therefore take advantage of the extra sauna services (with massage on reservation), aperitif / dinner and all the support to better organize your holiday. 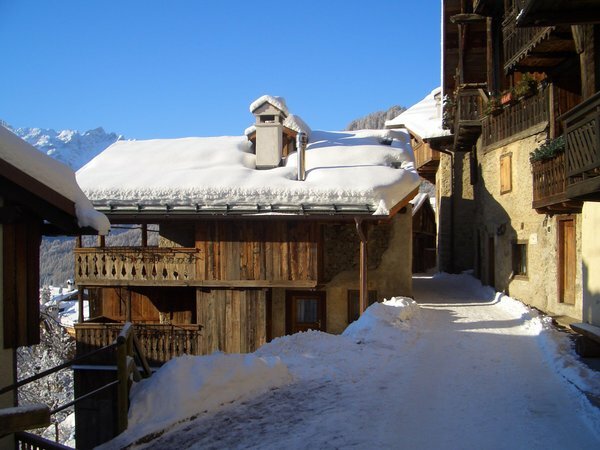 General information at 1000m amsl, 3/4 board, "bike friendly"
One bathroom, kitchen with traditional fireplace, original room lined with wood, balcony with view, TV and washing machine. On two floors, bathroom, TV, washing machine, living room and kitchen, balcony with view. Two bathrooms, kitchen, living room with sofa bed, terrace, TV, and washing machine. One bath, living room-kitchen, TV, washing machine, and balcony on the south overlooking the mountains. 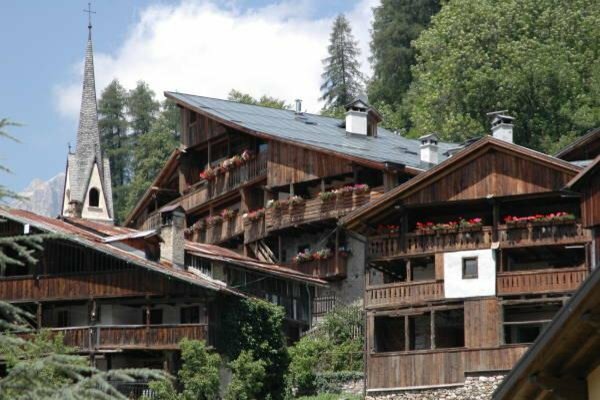 One bath, large living room, kitchen, TV, washing machine, and balcony overlooking the mountains. On two floors, two bathrooms, TV, washing machine, living room and kitchen, and balcony with view. 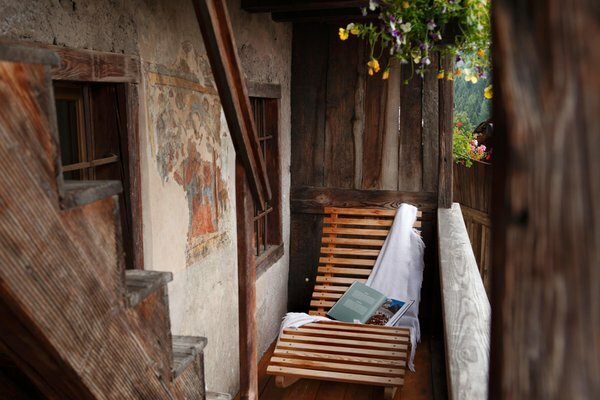 Bedroom with private bathroom, satellite TV and WiFi, balcony with mountain view. The attic room overlooks the rooftops and has a lovely view of the village church. 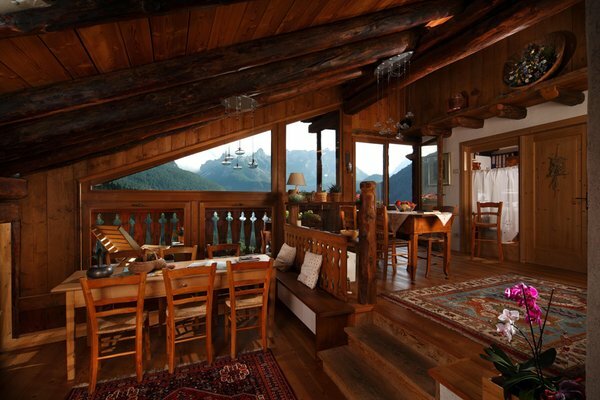 Cozy and with a typical mountain flavor, it has a double and single bed, a wardrobe and a desk. The room is equipped with LED TV with digital receiver and satellite, as well as with WiFi. 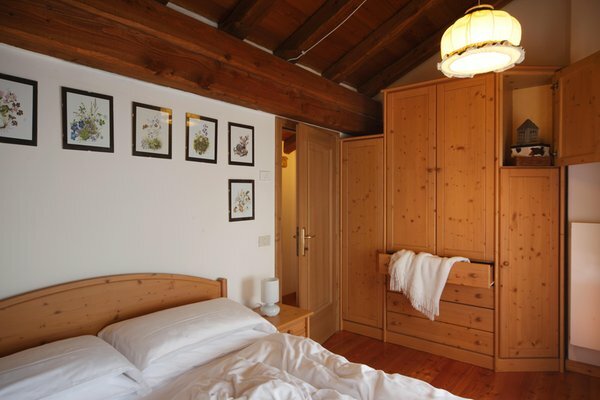 Double room with balcony overlooking the Dolomites. 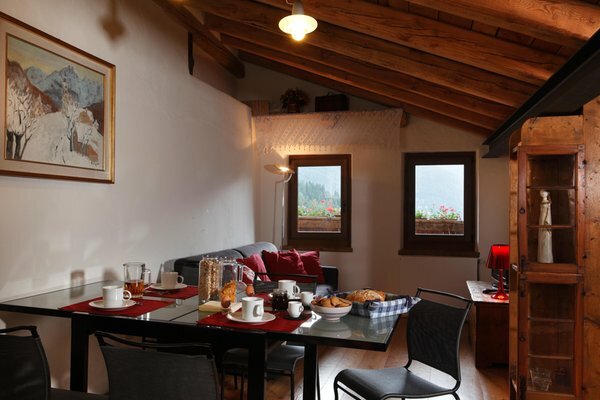 Equipped with WiFi, HD TV and satellite channels for foreigners, fridge and kettle. More spacious and with a fully furnished bathroom, it is ideal for longer stays. 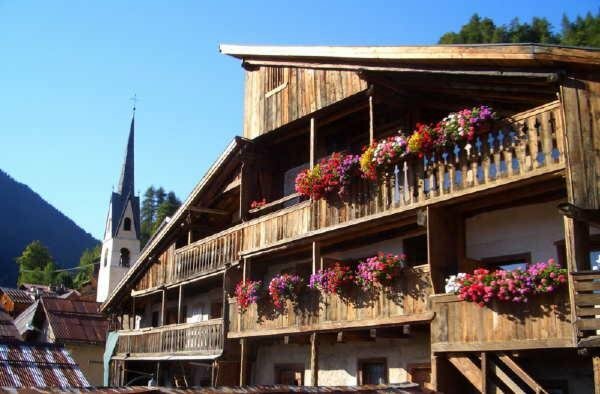 Small but romantic, with a lovely balcony overlooking the mountains. Equipped with wifi, TV sat, hairdryer and soaps. Room on the second floor with private entrance. Organized on two levels, on the first floor it has a small living room with a small corner to prepare a coffee / tea snack, sofa and TV HD sat, WiFi, while upstairs there are a double bed and large bathroom. 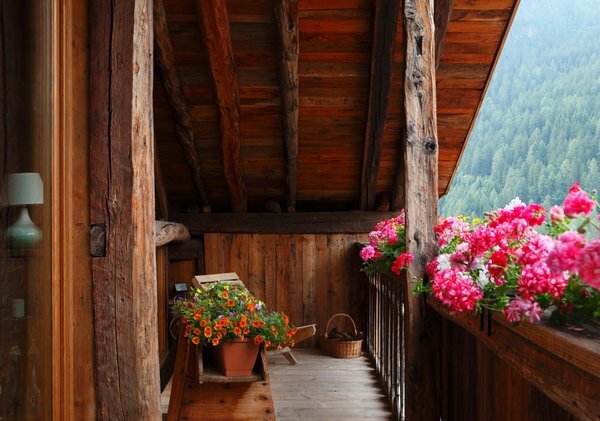 A small terrace overlooks the Dolomites. Room with separate entrance on the second floor. Small but with all the comforts, on the first floor there is a small living room with wardrobe, a corner for a coffee or a cold meal, HD sat TV, wifi; on the second floor, as a mezzanine, a double bed, a large bathroom and a nice balcony with view. 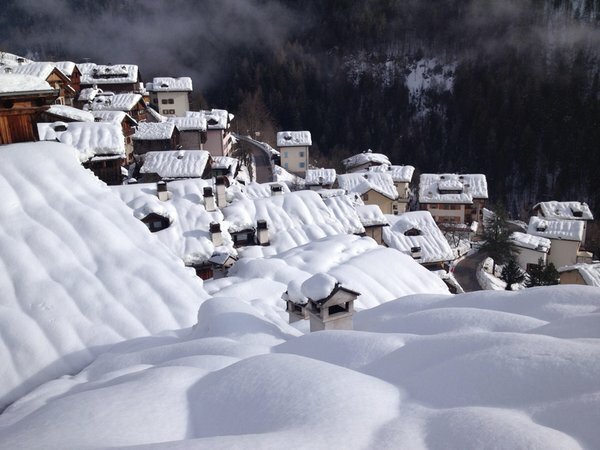 We could hardly wait to return to Dormi e Disna. Last year we stayed in one of the apartments for a month and this year, because of limited time, we choose to book bed and breakfast only. 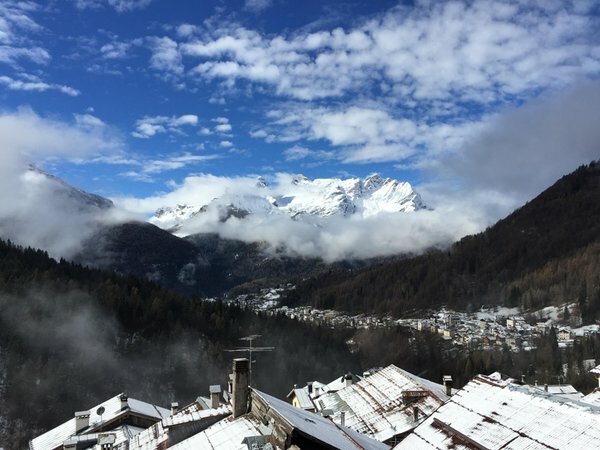 What a pleasure to visit with Anna and Renato (owners) again to great our neighbours, to buy produce from the fruttivendolo, and to wake up to a view of the gorgeous snowy peaks! 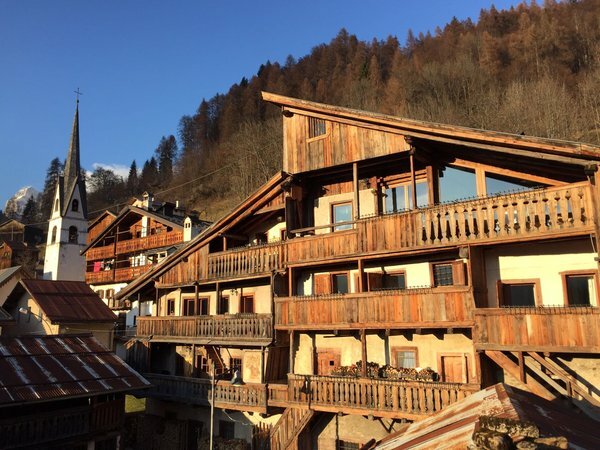 Our room was lovely, as we anticipated, the walks to town to see the butcher and the baker and eat out were as exhilarating as previously and the church bells reminded us of the calmness and beauty of living in the mountains. To top off our visit it even snowed the day that we left! We definitely recommend Dormi e Disna to all of our friends. 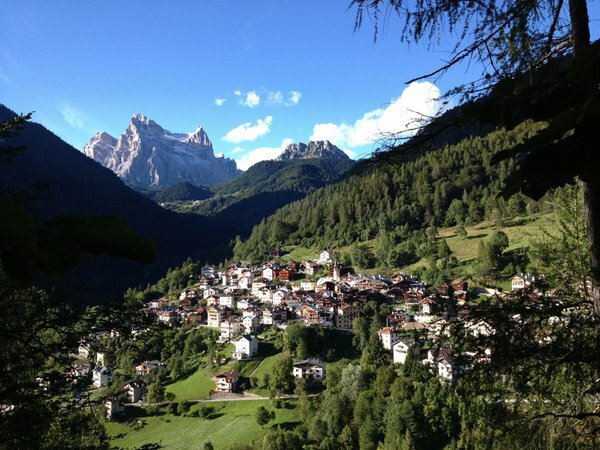 Dormi e Disna is a very special place in a peaceful mountain village of the Dolomiti Bellunesi. 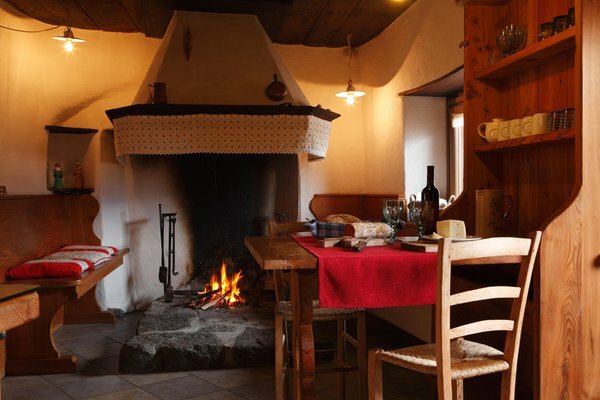 The owners have taken great care to preserve the original architecture of this authentic house of the Zoldo Valley. It is a most astounding example of how renovation with love for preservation can go hand in hand with modernizing. 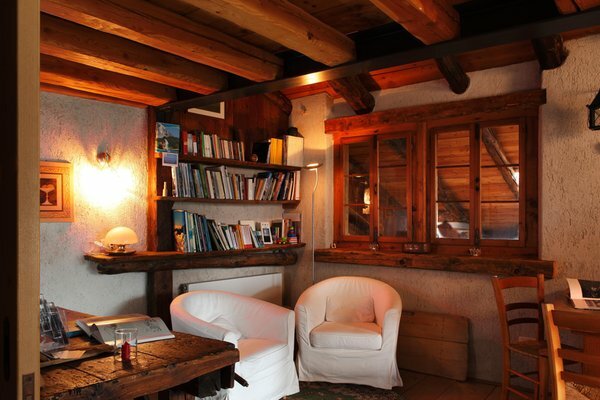 The minimalist style chosen for the interior emphasizes the beauty of the preserved walls and beams. No element introduced seems intrusive, instead glass, stone, wood and steel have been combined to give light to the antique structure of the past. 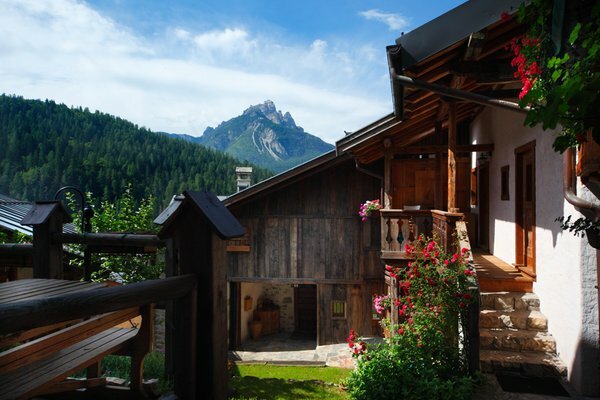 This holiday home is a place were the soul can fly through over the balcony, across the valley to one of the most spectacular views of mountain ranges ever seen from a bedroom window. The owners at Dormi e Disna are very warm hearted and accommodating. 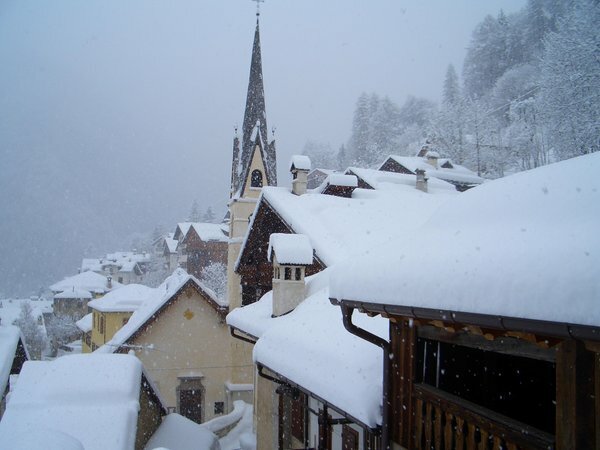 They are at all times ready to share their extensive knowledge of the area, helping with plans for trips, skiing and climbing tours. We relished every minute of our stay at Fornesighe and have already booked next year's stay. 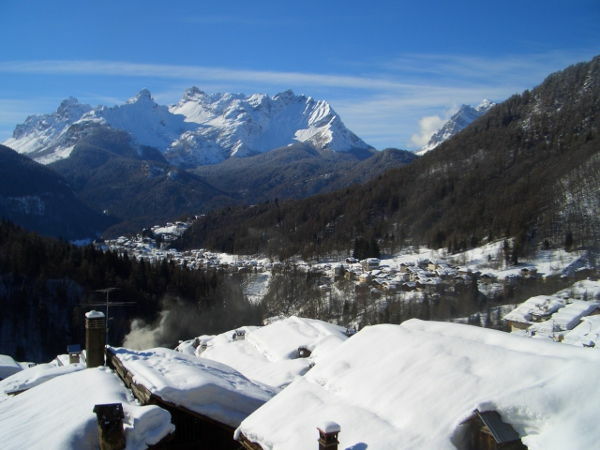 Information about the location: at 1000m amsl, nearest slopes at 14km, closest cross-country trails at 7km. Are you interested in Rooms + Apartments Dormì e Disnà?